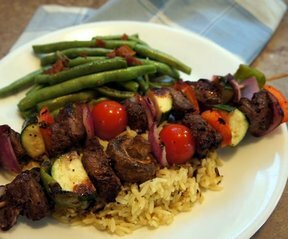 These meat and vegetable skewers are so tasty. Serve them over rice and you have yourself a meal. In medium bowl, mix soy sauce, brown sugar, vinegar, seasonings and carbonated beverage. Reserve about 1/2 cup of this marinade for basting. Place steak in a large, resealable plastic bag. Cover with remaining marinade, and seal. Refrigerate for 8 hours or overnight. Thread steak and desired vegetables onto skewers in an alternating fashion. Discard marinade and the bag. Lightly oil the grill grate. 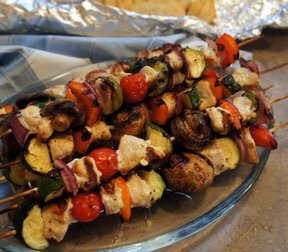 Cook kabobs on the prepared grill for 10 minutes or to desired doneness. Baste frequently with reserved marinade during the last 5 minutes of cooking. "I marinated my vegetables (onions, red peppers, mushrooms and cherry tomatoes) in Italian dressing while the meat marinated. 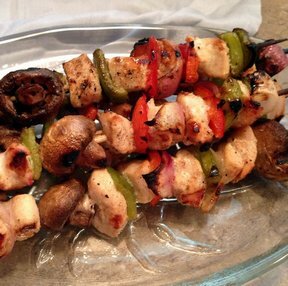 Great skewers!"